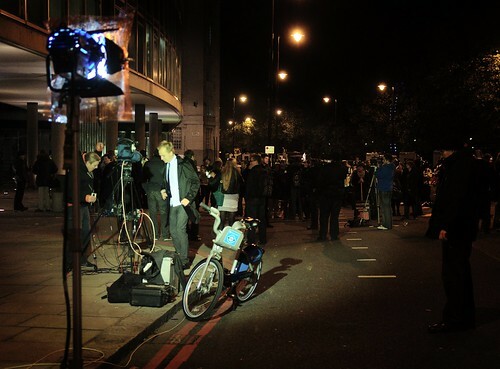 This was during the first of the student protests last year, when Conservative Party HQ was smashed up for the cameras. It was long over by this time, but there was still a large backlog of arrests being processed in the background and obviously it was still the top story on the rolling news channels. The rest of Millbank, a dual carriageway which feeds traffic into Parliament Square, was a delight to cycle down thanks to the lack of vehicles. London’s road network is, of course, vital, and disrupting the flow of traffic through it costs the economy eleventy gazillion pounds an hour. Did the striking workers consider that before they marched down Whitehall yesterday? Some motorists would have been forced to go the long way around thanks to their actions. As Ed Miliband put it, referring to schools being closed, yesterday’s strikes caused a lot of inconvenience. And how dare people put their livelihoods ahead of convenience. It could have been a line borrowed from Conservative Assembly Members’ script. Sorry, we can’t provide for cycling because to do so would mean taking away a tiny little bit of the provision we have made for motor vehicles, the Tories say. It might mean making drivers slow down a little. And that would cause inconvenience. How dare cyclists ask to be allowed to cycle in conditions that don’t cause them to fear for their lives — conditions that effectively close the option of cycling entirely to large sections of the population — when to do so would cause a few people a bit of inconvenience. This entry was posted in Uncategorized and tagged bike hire, cycling, london, london assembly, millbank, politics. Bookmark the permalink. It’s not even just inconvenience. It’s *short-to-medium-term* inconvenience. In the long run, improving conditions for cycling will improve conditions for motorists as well. But yes, in order to realise those benefits for themselves our beloved motorists might have to sit in slightly longer traffic jams than they already do. They might be 2 or even 3 minutes later than they already are. Heaven forbid!